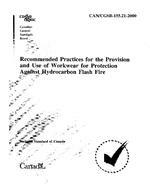 These recommended practices provide guidance for the selection, use, maintenance, retirement, and understanding of the limitations of workwear for the protection against unplanned exposure to hydrocarbon flash fire by wearers, employers, and others involved in programs requiring such protective clothing. The use of workwear providing protection against hydrocarbon flash fires should be incorporated into a proper safety program that also utilizes appropriate administrative and engineering controls in addition to proper safe work procedures. Minimum performance requirements and test methods for single layer and multi-layer garments are addressed in CAN/CGSB-155.20 - Workwear for Protection Against Hydrocarbon Flash Fire and are not included in this document; however, other considerations regarding selection of workwear when preparing a purchase agreement are included. Workwear for protection against hydrocarbon flash fire is available from a variety of manufacturers, in a range of items (coveralls, pants, shirts, vests, parkas, rainwear, disposable garments, aprons, etc.). Workwear for protection against hydrocarbon flash fire is made out of a variety of either inherently flame-resistant fabrics or fabrics that have been treated with flame-resistant finishes.